Greek statues redone in metal stick figures. The whole reinterpretation of interpretation is fascinating to me. Hey there. I love this. If you ever want to get rid of it or make me one, I have the perfect place for it in my pond area. Your pea pods made me chuckle. Actually, nearly every figurine I post is one that has already sold; I make figurines on commission and don't start welding until I receive payment. That said, this one is already slated to be shipped off. talk about, but we have to know something about the artist.So would you please tell me your name and something about your live? 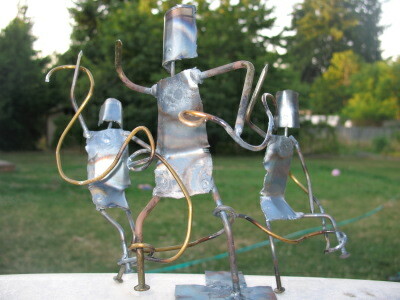 And what was your inspiration to make this sculpture? You chose my sculpture? Not the original, created back in 200 BC? Weird. I also chose your piece of art for a project in my Latin classes, I'd like know your inspiration. And also why you made it, a short description of it...I also need your name and some information of your life. Thanks.